On 12th July 250 year 10 students at Alderbrook School each had the opportunity to meet with six different employers from a wide range of professions including solicitors, finance, hospitality, creative industries and the armed forces as part of their Life Ready ‘Thinking Futures’ day. The day was driven by Kate Read, Assistant Headteacher at Alderbrook and Richard Guy, Co-Founder and Managing Director of SimkissGuy Recruitment, who has been working closely with school Senior Leaders, Kate and Anna Allen also Assistant Headteacher to help develop the programme of employer engagement as part of his role as the school’s dedicated ‘Enterprise Adviser’. One pupil involved in the day said they “enjoyed meeting with a wide range of employers, in particular hearing from a number of ex Alderbrook pupils who are now working in a range of careers, which was really inspiring and powerful”. The pupils that took part agreed the top three employability skills they developed and used during the day were communication, networking and team working skills; and of the 18, year 10 pupils, interviewed, more than 50% said the day had made them think more about what they wanted to do when they leave school and helped them prepare for later life. 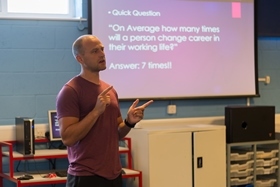 The first Life Ready day of the academic year which was held in May was focused on employability skills, online profiles, considering strengths and developing a characterful CV. Thinking Futures day in July is all about exposing students to a wide range of professionals to underpin employability skills, profiling, personal branding and career decisions. The final day which is scheduled for October is to develop a CV, practice application forms and mock interviews. This is purposely planned just ahead of their college applications. Life Ready is being rolled out to schools and colleges across Solihull, to raise the standards of careers guidance and develop independent, dynamic, young adults. The programme is the local delivery for the Careers & Enterprise Company Enterprise Adviser Network; matching schools with Enterprise Advisers (business volunteers). If you would like to learn more about Life Ready and how you and/or your business or school/college can be involved, contact Hannah Colson on 0121 704 8737 or email lifeready@solihull.gov.uk.